To many seaside dwellers, Spring cleaning means getting the neighborhood and beaches cleaned up from Winter debris and ready for Summer. One such community is Sandwich Downs in East Sandwich MA. According to resident Bill Dewire they have held an annual beach cleanup every Spring for over a decade. They also have one after July 4th. Each time it involves the neighbors, their children and friends who enjoy this beach year round. The neighborhood association organizes a day each Spring and supplies the bags. Residents come armed with shovels and rakes. 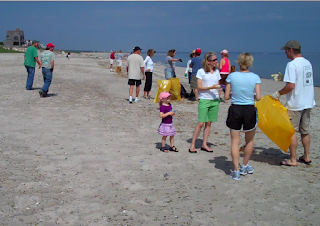 The beach cleanup is always a big success! 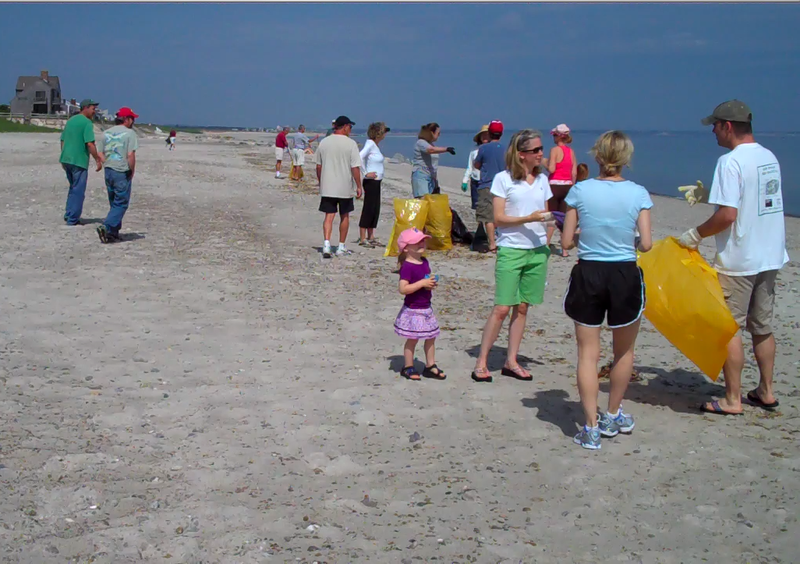 Many of the one hundred families participate, raking up seaweed and scouring the beach for unwanted trash and dangerous objects. They collect several dozen bags of waste. Among the endless collection of plastic they unearth bottle caps, toys, flip flops and one year, a four foot whale bone! Year long, the residents here are pretty diligent in picking up after themselves. A clean beach is important to all. However, like any ocean community, things get misplaced and lost in the sand, boats passing by sometimes toss items overboard, and many things float in from neighboring towns. Each section of this beach has an ample supply of recycle and trash bins as well as "doggie bags" at the boardwalks for everyone to use. They also have abundant signage to remind everyone to be green and save the blue. We think it's great! 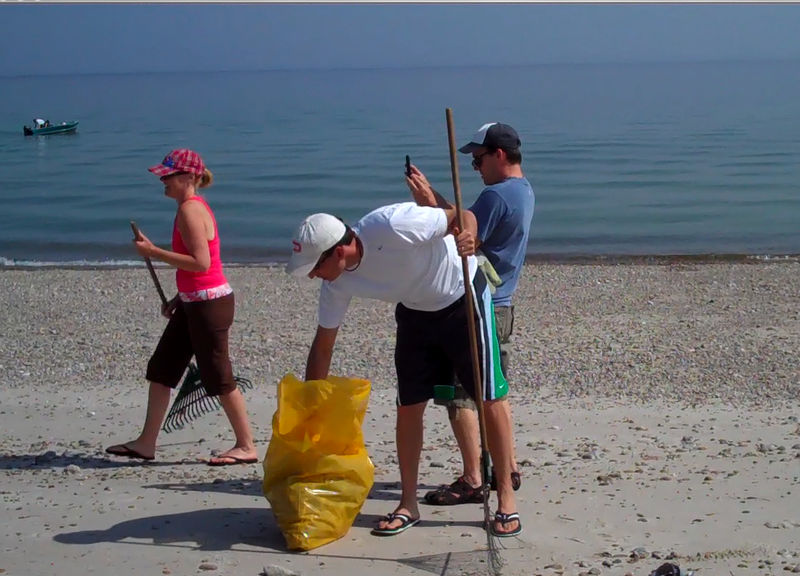 We can all take part in year round maintenance of all our beaches and natural surroundings by doing our part. 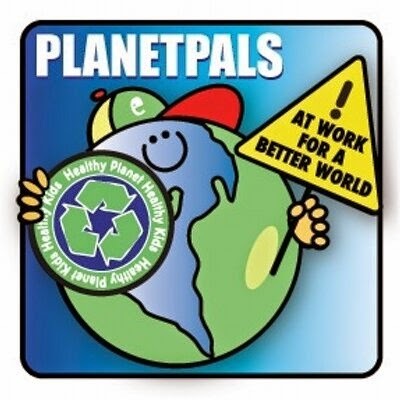 Remember, the next time you are at the park or ocean, to use the bins provided, bring your own bags, be a PAL and keep your world clean! 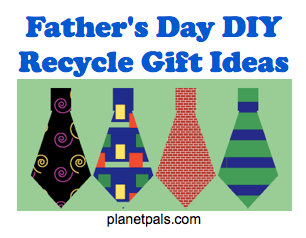 Planetpals Favorite Collection of Recycle Craft Ideas for Dad For Father's Day That Anyone Can Do! 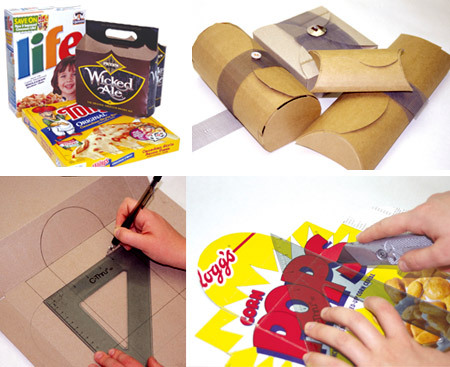 Make Father's Day even more special with a talior made gift that can be fun or even useful as well as eco-friendly! Tell a story about your father with a card that encompasses some of his favorite objects and photos. Make a custom designed tool jar or fishing box. Award him a trophy for his special talents! All these projects are doable at any age and for any level of expertise. 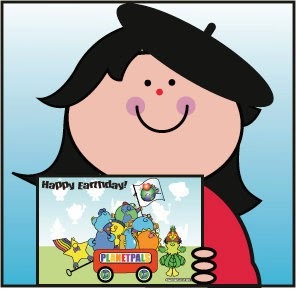 Have fun and be green! 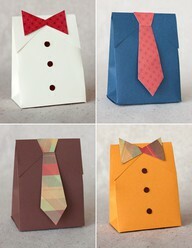 Start with recycled paper , card or make your own paper from recycled paper. Add mom or dad's favorite buttons, trinkets, trip mementos, old keys, tools, old jewelry and photographs. Make it meaningful. Many versions. Unique Ideas, how to instructions, samples. Make a treasure jar for holidays, mothers day, fathers day, everyday. Simple and Easy. Dad Bags for Father's Day Lots of fun for any special mom and dad. (Add buttons, flowers and bows for mom). Make a gift and put it in a home made Bag. Try to use recycled materials to decorate your bag, too! 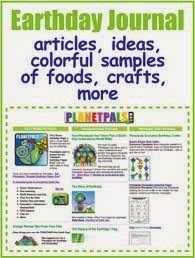 For more Father's Day and Everyday recycle craft ideas such as paper mache, paper making, gardening etc go to Planetpals Craft Pages. 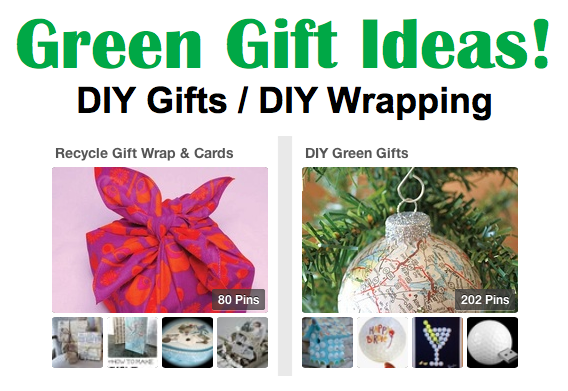 Or Check out PLANETPALS Pinterest Boards: DIY Green Gift Wrap and Cards and DIY Green Gifts. It's summer and to many that means camping trips! 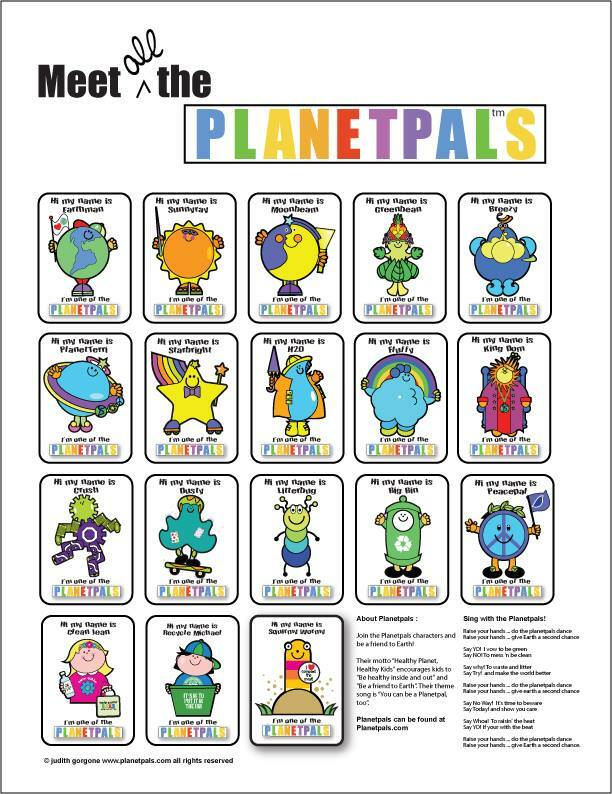 You can be a Planetpal when you go camping! For a lot of people camping is a lifestyle and to others, this year in particular, it's an economical way to take the family on a vacation. According to the UK Telegraph "Nearly double the number of holiday makers are considering a camping holiday this summer as the recession forces people to cut back on expensive holidays". 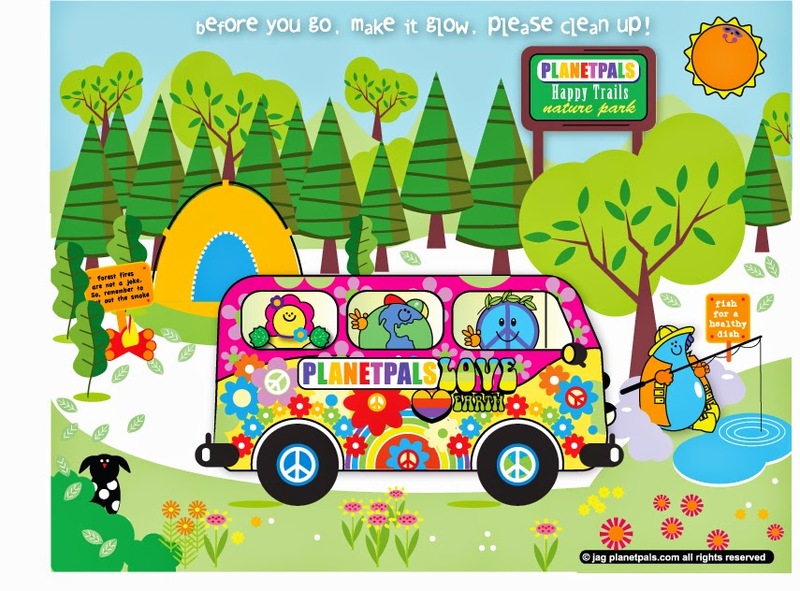 Camping can be fun and green, too! Repurpose items. Be creative! Make a sleeping bag liner from old sheets, a tent catch all from a multi pocket shoe bag, a water container from a juice bottle. Use your imagination! 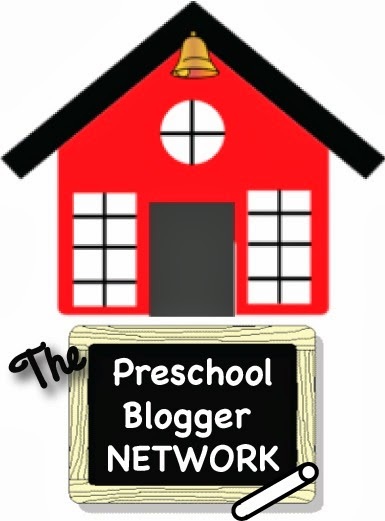 Be thrifty! Hunt for camping gear at yard sales, thrift shops, on freecycle or the swap shop at your town recycle center. People often disgard great camping equipment and useful items they no longer need. Give your old tent, canvas and camper textiles a new life by steam cleaning or fabric freshener (ie: Fabreeze, ammonia and water, other solutions) to freshen them up! Use reusable containers, dishware and silverware instead of disposable ones. 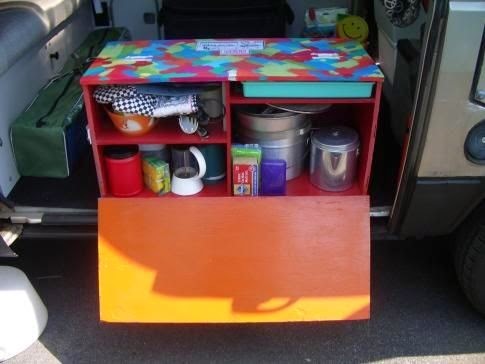 Have the kids wash them out after meals-Make it part of the camping experience! Toss the junk food! Plan more natural meals. Try grilling fish you catch or fruits and veggies you grow. Make it all part of the natural experience. Why not have everyone think up a recipe to try! When you leave, leave a "no trace" campsite! That means pack plenty of trash bags and use the campground's trash and recycle bins diligently. Make one of these handy recycle trash bag holders for your tent or RV. Whatever you do, care for your natural surroundings and they will stay that way for you to enjoy for years to come. Recycle Finds: We found this old camper kitchen (chuck box) and repainted it, put new handles, hooks and a folding paper towel holder! Now, it's good for another 30 years. 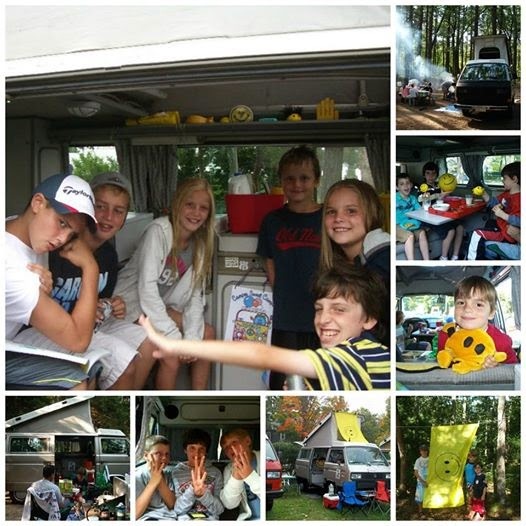 See what you can find and what you can think up to make your camping experience greener , more functional and more fun! 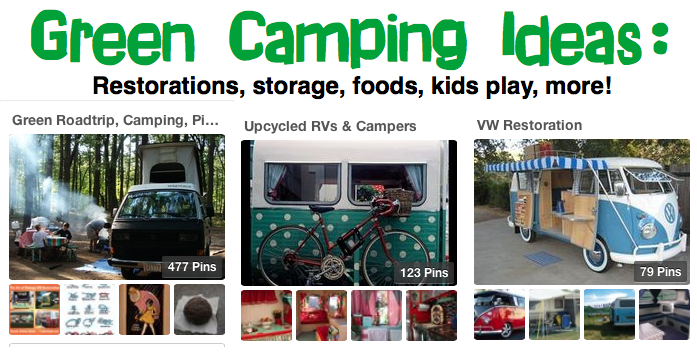 Follow our Pinterest boards on Camping! Greensapirational!